What once brought kati rolls and an often-panned buffet to Midtown South at the late end of the Brooks Era has been shuttered. 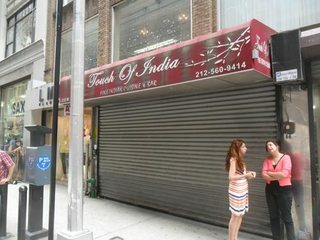 Touch of India, which was across from my last job on 37th btw. 7+8th (shout out to my guys on the 11th floor, you know who you are) and didn’t really do much on the Midtown Lunch radar, has closed. If you’re looking for your Indian fix, there’s always Kati House not too far away (on 36th btw. 8+9th). Posted by MJP at 1:35 pm, July 15th, 2013 under Touch of India.